Ben got his first Piggy Bank as a gift during Christmas. He's 2 and loves money ~ he likes to put coins in his pockets.. so this was another perfect gift for him. 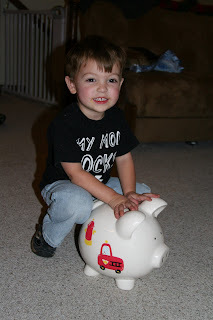 Ben occasionally finds loose coins on counters ~ and now chases us down so we will help him put it in his piggy bank. too funny! that's a huge pig! !